A lot of attention is being directed toward, among other things, a major “reset” of the global financial system. It is long overdue. The mysterious deaths of bankers around the world, largely under-reported by mainstream media, are not by happenstance. There remains a belief in some areas, that “dead men tell no tales.” That is another “truth” that will soon be shown as the myth it always was. That being said, the financial system change is part of a larger, more important “shift” that is under way… that is, a major shift in the evolution of human consciousness, awareness, and beingness. It marks the “Coming Home” of our understanding and acceptance of who we are, as immortal beings, “born” from love, and if one’s evolution is to happen, to love we will, of our own volition, choose to return. The “terrorist” that poses “the threat” could be human, but it doesn’t have to be. The presumed “enemies” could be “aliens” of the microscopic kind, or from realms beyond this world. The world that we know, and have known, and virtually all that is within it, is all a psyops operation. That which we have been fed as “truth,” has been what someone wants us to believe is true. We’ve been led to believe that we had little power in the way life unfolds here on earth, when in truth we are the power behind what happens here. Keep the powerful thinking and believing that they are powerless; keep them thinking that something outside of themselves – money, jobs, a “degree”, a “lie-sense” – is needed in order to make changes; keep them pointing at each other as the source of their problems and “enemies,” and goad them into destroying each other, and self-destructing on their own. That is what has been happening, all by design. The real target of the psyops operation has been, and continues to be, the innocent, trusting, systematically “conditioned,” human mind. That means your mind, and mine, if we haven’t reclaimed ownership thereof, and responsibility for what we allow to come in, and what goes out. We may not be able to “control” what comes into our mind, but we do control our response to it. We have equal “response ability” to diffuse fear-raising information and not give it further life and energy by believing in its inevitability. If we tend to habituate within the frequency of fear, then our mind and the thoughts that go through it, will not be our own. The goal, sought by the manipulators of public products, policies and perceptions, was that humanity continue looking outside self… for someone else to be our “savior.” It could be to money (which often makes problems bigger when source thinking doesn’t change), or even space brothers, who have not yet been officially recognized as existing. We’ve cultivated the opinion that humanity is not “evolved” or intelligent enough to fix the problems that so many people are convinced have become insurmountable. Look at all the scientists with all their Ph.D.s, that have figured out how to poison and pollute our waters, air, soil, and bodies, but not how to restore the balance and clean it up. Our problems aren’t due to lack of intelligence. We can heal the planet and feed its people, because the planet can protect and provide for all who live thereon, or therein. Our problems have been orchestrated. Not predicted as being prophetic, but suggested into probability through prophesy. The future can just as easily be redirected by our decision to return home. The knowledge and ability to solve virtually every problem that has plagued us… problems of energy, poverty, enmity, and disease, can all be put to rest, when we make the conscious choice to return to love. “Returning to love” doesn’t mean going anywhere; it means being who and what you are, all the time. This is a choice that doesn’t require anyone else’s agreement or participation, although you can rest assured, you will not be alone. If you want to know God, you must only know yourself. If you claim to love God but don’t love yourself or fellow humans, or life, then you’re fooling yourself. We have been purposely given ample reason to not love, which means, to be fearful. Hatred is not the opposite of love. Hatred is an expression of fear. Violence, oppression, and all forms of injustice, are expressions of fear. The flames of fear have been purposefully and artificially fanned for millennia. And yet, humanity is continuing its awakening… and its return, to love. Love is the only true litmus test of evolution; not technology. If you think technology makes us more or less “advanced” than another person or group, then you’re still in the box, drinking the Kool-Aid, and don’t even know it. In order to truly experience the power and majesty that is your birthright, you must love. It is the only way that you form a conscious resonance with Source, your Higher Self – a part of the Human Being that everyone has. 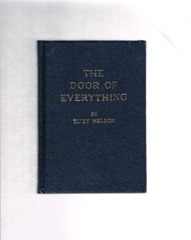 In the book, The Door of Everything, by Ruby Nelson, the Higher Self is referred to as the Grand Cosmic Being. We’ve been taught that we have a physical body, but not that we have a non-physical one too. This is a scientific fact, not a “metaphysical” musing. The physical (or material) form, which has a net positive polarity, could not exist without the non-physical (or antimatter) one, which has a negative polarity. The difference, in the ability to see and interact with beings who exist on higher planes while we yet have a physical form, is fear. Fear will limit where one is able to travel. The expansion and liberation of consciousness, comes with the decision… the choice, to go home… that is, to love. We’re not to love just those who agree with our point of view; we’re to love the whole. Your point-of-view would have little or no meaning if it weren’t for others who have different interpretations and points of view, including disagreement, regardless of degree. Disagreement does not have to mean disharmony. It simply means that resonance has yet to be achieved. For some reason, a small group of individuals got together a long time ago, and decided that they wanted to control the human population. They’ve done a masterful job. In so doing, they’ve also fucked a lot of things up. Fortunately, what man has put asunder, man can fix as well. We’ve got to stop waiting on God to pick up our dirty clothes and repair our planet’s broken ecosystems, when we’re able to do it ourselves. Who are these people (if they are human)? I don’t know. I can point in a few directions based on what I’ve read, but it’s not really important to me. What’s important is to realize the Grand Ruse for what it is, and start one’s journey Home. You won’t have to go far. You may simply start by stop trying to run away (escape), and instead, discover the quiet serenity of the world that lies within you, because that is where “history” is changing, as you change your story, and I change mine. What, in truth, are we running away from? Love. It’s the only thing that is valuable, so much so as to be priceless. When you’re doing what you love to do, when you’re being what you love being, everything in life is better. We’re entering a new era in “official” human history, which is actually a journey in consciousness. It is an era wherein our perspective and views of reality, the universe, and the life that goes on within it, will change dramatically. Among the most profound of the changes before us is that space is revealed to be a well-traveled frontier, filled with life, travel, commerce, and civilization. There are some that want us to view this momentous occasion through fearful mental and emotional lenses, in part to cover up or distract us from an unfathomable spate of crimes against humanity, some of which are still being perpetuated, that most of the population have still not yet awakened sufficiently to recognize. Before us is entry into a New Reality Threshold more closely likened to that depicted by the Star Trek franchise of television and film, and in such epic films as E.T. the Extra-Terrestrial, Close Encounters of the Third Kind, Star Wars and The Day the Earth Stood Still. Our perceptions have likewise been titillated, twisted, and perverted by films like Alien, Blade Runner, The Terminator, and countless others… far too many to list. 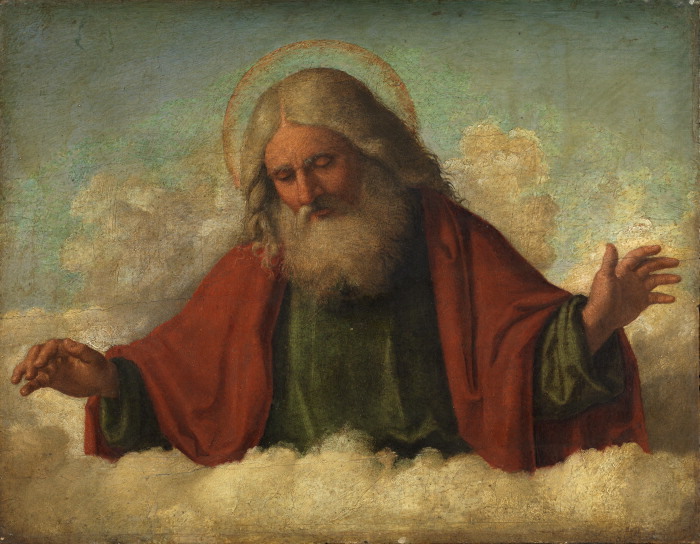 Boundaries have been created by religious doctrines that encourage believers/followers to believe that humankind are “sinners” and that God is an entity that sits in the sky in judgment, who requires us to jump through innumerable hoops in order to curry “His” favor. How else might some of us see God as some benevolent being that watches over (or judges) us from a distance, in contrast to an “evil” nemesis called by various names? Every individual who believes that story, and has his or own interpretation of what it means, would be surprised to learn that each interpretation is uniquely one’s own. 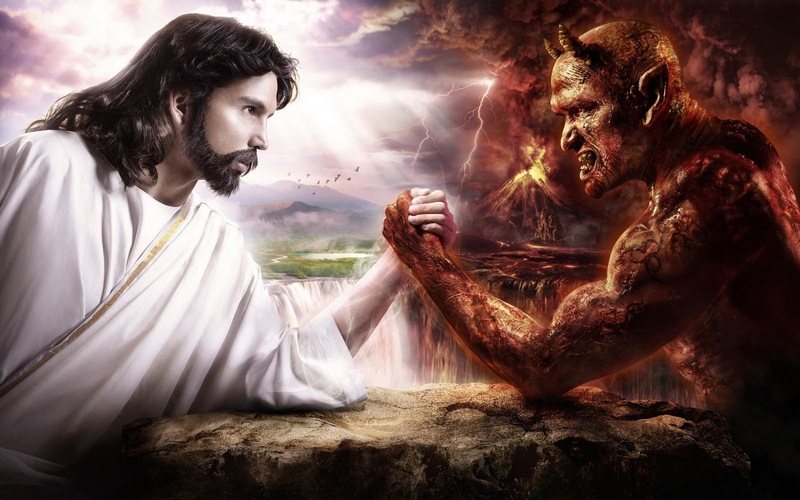 They might find it hard to accept that the “power” of the idea of God and Satan, as in “good” and “evil” lies in the belief itself, and in the disruptive polarization that it fosters, in contrast to inner harmonization and synthesis. That “the power lies in the belief” is yet another indirect way of saying that the actual power lies in the believer. That is, you are the creator, i.e., the giver of the life to, and power of, your beliefs, whatever they may happen to be. All you need to do is give it your attention, and the rest will follow. That is why this psyops operation is significant. That is why your realizing that you are the empowering factor to all realities that you experience, is even more important. Don’t expect the psyops operations to stop on their own, but you can stop believing that your very well-being depends on what the talking heads tell you. If you turned the talking heads off, you’d be surprised at how your life calms down. Your well-being depends on you and the choices that you make; starting with your choice to love, to forgive, to be balanced, to be harmonious yourself, and to be grateful. At peace Within comes to mind. At stake is where you want to go from this point on… do you want to go where the erstwhile “powers that be” are trying to herd you? Or would you like to listen to, and follow the “beat” of your own heart’s drum? We were being led into this area of belief – of impending destruction, disease, and doom – long before becoming aware of the intentional herding. Indeed, many, if not most of the population have yet to recognized it, as we have adopted many ways to rationalize the crimes that we either perpetuated, or allowed to be perpetuated against other human beings. And let’s not forget to send some love to the Medical Industrial and Government Corporate Complexes that work diligently to nano-engineer the environments within the body, and geoengineer the ones outside, both with harmful results. Then they establish professional and public policies that appear to leave the public with no choice but to take what they deem appropriate to give or force upon us. FAILURE of “public” agencies to stipulate or enforce such disclosure in the public interest. APPROVALS by the alphabet agencies, i.e., FDA, of thousands of products presented as medical remedies – pharmaceuticals – that are literally worse than the problem that they are intended to eliminate. I could go on, but the pattern is revealing itself. These are all practices that cannot sustain themselves, and hinder the sustainability of life. Weather patterns appear to be more extreme, in both directions; greater cold and heat. In the U.S., snow acted like plastic and didn’t melt in the east, and it didn’t rain in California. Not only are these the effects of an unsustainable model, they are wholly and truly unnecessary, and reversible. A massive attempt has been made, and continues to be made, to keep the masses impaired and unawares of a massive even larger, ongoing, more pervasive “war” that began long before any of us (very likely) actually arrived on this planet in this life. These are the forces behind the policies and practices, as well as the stories that become “public.” These are factors that influence and determine what movies get made, what actors act in them, who becomes the “leaders” in science, politics, and education. If one didn’t know better, it might be called, a war against humanity. What is happening is certainly a crime. While the wars that we fret about may appear to pit one group of humans versus another. It is humanity as a whole who are the target. The “battle” that is being waged is the prevention of you and me waking up and consciously knowing who and what we are by trying to convince you that you have something to fear, even government itself. Ray Kurzweil, Director of Engineering at Google, is in my opinion, the William Shockley (1910-1989) of our time. Shockley, who was a co-recipient of the Nobel Prize in Physics (1956) for his role in the development of the transistor, used his scientific pedigree, and its inference of infallibility, to go on a campaign to assert that, on the basis of genetic differences, blacks were inferior to whites. He further asserted that due to reproductive differences, the inferiority gap between blacks and whites was widening. I can’t say that I remember the moment that I first heard Dr. Shockley present his opinions of inferiority of black people, but I do remember the feeling. Listen to it at roughly 6:40 of the video below and see how it touches you. It didn’t feel right to me. It didn’t feel true. I couldn’t see any benefit for anyone to go around attempting to establish this idea as a scientific fact, but then, I was barely a teenager myself, and knew nothing about psyops in those days. A product of the “advanced” higher education system, and recipient of lofty scientific accolades, Dr. Shockley had to feel pretty secure in his intellectual position, dumb as it may have actually been. Kurzweil’s assertion of the inevitable integration of human with machine, even to the point of offloading one’s memory into a computer in some lame attempt to “live” forever,” is ludicrous, if one has a modicum of understanding about the nature of the physical/non-physical matrix, and the information field that interfaces with it. 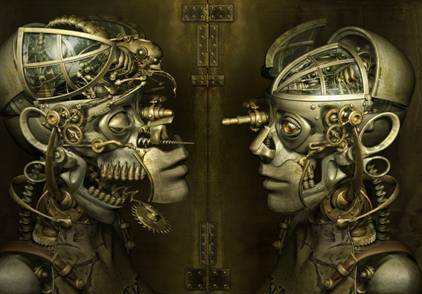 Of course, Kurzweil isn’t the lone proponent of transhumanist theory. With his vast store of knowledge, physicist Stephen Hawking may very well, wish he knew how to restore his body to normal. It may also be easy for him to believe that if he hasn’t been able to figure out how or why his body degenerated so severely in his lifetime, then healing must not be possible, and cyborgianism must be the only answer. I’m so glad that I’ve learned there are more answers than have been imagined as questions in the halls of our great institutions of higher learning. And that’s how psyops work. If men as “brilliant” as Ray Kurzweil and Stephen Hawking are pronouncing the inevitability of a human to machine “meld,” then who are we, owners of no scientific accolades whatsoever, to question or challenge them? Well, if you don’t ask yourself if transhumanism is “right” for you, you’ll never know the truth. Given my confusion behind the William Shockley media tour in the 1960’s, it was a joy to speak with Dr. Bruce Lipton, author of The Biology of Belief, many years later, who explained that genes are not the sine qua non element that determines the being. You wonder how many “black” and “white” people are still going through life needlessly burdened with the mental residue of Shockley’s spiritual ignorance. But then, we can’t blame William Shockley or Ray Kurzweil for our spiritual ignorance. Our “response ability” in each case is the same. All we need to do to begin growing, is head Home. Willingness is the differentiator. I’d like to call your attention to my video reading of The Door of Everything, by Ruby Nelson. Listen if you care to hear another perspective or take on reality, who you (we) are, and what your (our) true potential may be. You are free to dismiss or disbelieve it, but you won’t find any internal flag against the possibility that these statements and thoughts are true. It may be no surprise that as I was writing the previous paragraph yesterday, I got a call from a dear friend whom I visited while in Nashville. I told him about The Door of Everything during that time. He called to tell me that he and his wife had purchased and read the book, and it was the most profound piece of literature they had ever read. They brought the book to the attention of the pastor of their church, Unity of Music City, who is ordering the book and will begin embracing and discussing the consciousness that it presents among the congregation. This is one aptly named church! The music is wonderful! There may be external triggered flags, such as what your religious belief system says that you are, and therefore who your “savior” may happen to be. There may be flags created by artificial suppositions and limitations insinuated by academia, “science,” medicine, industry, and technology. We assume that our “modern” methods are the best that has ever been, and represent the most beneficial methods and practices. If anyone were inclined to do some cursory investigation, they’d find that these assumptions aren’t supported by the facts. They’d see that there’s no reason to fear, no reason to imprison one’s self for an eternity in a computer cabinet. Every thought is already recorded in the Universal Memory. All we need to do to end this nightmare, is to start heading Home. Another grand article by you that is ‘right on the money’ so to speak. I stopped waiting for God in 1994 when I found out that God is here all along, inside every one of us and every thing. Since then I cannot be brainwashed any more. Since then I don’t fear any more. I KNOW that all we have to do is OUR BEST, and GOD will do the rest! We don’t have to KNOW a lot to please God, we just have to LOVE A LOT! The 21.12.12 was the spiritual rebirth of the prophet Elijah, who is back to bring us the truth: and the truth will set us free! The Apocalypse cannot be prevented. We can just make sure we are not victims of it, by means of our own proper actions. It is Gods way of helping the underdog and cleansing this planet of all rubbish (in his eyes), like he has done before when we got out of hand! God has no favourite children, but he does reward obedience! As long as we are selfish, immoral, hypocrites, materialistic, corrupt, worshippers of man and woman (movie-actors, singers, sport-stars, politicians etc), obedient to political and church leaders instead of God, nobody can safe us: not even Jesus!